Out of all the holidays, Thanksgiving is the one that seems to be most tailor-made for television, especially when it comes to comedies. Halloween and Christmas can provide great fodder but Thanksgiving is where you find the real meat and potatoes (sorry! ): burning the food, fighting with in-laws, exposing family secrets, learning lessons, forgiving each other, coming together, and solving everything by the end of the meal. In the real world, we may spend Thanksgiving trying to avoid sticky situations but in sitcoms, we like to pile on as many high jinks as we can think of before shoving in some overt sweetness during the last act. It’s hard to find a good balance in episodes like these, to craft something that doesn’t come off as completely forced. It’s why I’ve always had a general distaste for Thanksgiving episodes—as you can imagine, television is pretty rough for me during the last two weeks of November. It’s not that I’m a total cynic, it’s just that I hate being force-fed emotional manipulation around a dinner table. Fortunately, Bob’s Burgers rarely struggles with blending over-the-top humor with nice emotion. “Turkey In A Can” has a very real feel to it throughout, even though its main story is about turkeys that keep ending up in the toilet. In fact, this actually highlights something I greatly enjoy about Bob’s Burgers: its ability to heighten and out-weird the tropes that many sitcoms get bogged down by. Bob doesn’t ruin the turkey by leaving it in the oven too long or dropping it on the way to the table, but instead keeps unknowingly putting turkey after turkey into the toilet. At first, I was a little disappointed in how predictable that plot was. It becomes clear early on that Bob is the culprit, especially as he keeps popping those allergy pills—at least they’re less destructive than the absinthe from last Thanksgiving—and gets increasingly obsessed with having a perfect holiday. Still it’s hard to fault the show for this when there are so many great things happening as a result. While the overarching turkey mystery is funny and creative, the best parts of “Turkey In A Can” are within the smaller stories, the throwaway conversations, and bits of character growth. We learn that Linda is incapable of dealing with bathroom stuff, whether it is a turkey in a litter box or toilet training her children, so the image of Bob patiently dealing with the baby Belchers puts him in a gentler, sweeter light. There is the return of characters like Aunt Gayle (armed with a bunch of cats and accusing Linda of being untrustworthy because Linda once changed the television channel while Gayle was out of the room) and Teddy (who spent ages seven through 14 being toilet trained). There is also a nice story about Tina’s continued baby-steps into adulthood while she tries to convince her family that she’s old enough to sit at the adult table. Tina’s ideas of adulthood are both childish and familiar: she tests out different lipstick colors, dresses up to play the part, and practices her talking points (“In this economy…”). The best gag is when she tries and fails to cross her legs, clumsily falling off the chair. The end of “Turkey In A Can” is, without a doubt, the kind of sweetness that is basically required in a Thanksgiving episode. Bob and Tina are my favorite pairing on the show because they’re a father-daughter duo that feels realistic. Sure, Tina is a weird individual but at her core she’s just an incredibly confused adolescent, dealing with her budding sexuality, and trying to find her place (in school, in the family, in the whole grand scheme of the world). She’s stuck in that precarious and frustrating phase where she’s trying to grow up but finding it nearly impossible to do. Bob doesn’t fully understand Tina and sometimes can’t hide his reactions to the strange stuff she says and does but he’s never outright dismissive. It’s the beautiful thing about Bob’s Burgers: No matter how weird any of the kids get, the parents never make them feel bad about it. Still, Bob is a father who is a terrified at the thought of his daughter growing up because he’s powerless to stop it. Tina trying to force her way into adulthood via the adult table causes Bob to regress back to a time when she was a baby and needed him for everything. It’s a little on the nose and the whole thing is sugary sweet but it’s balanced out by the absurd fact that Bob is trying to potty train a turkey. It’s wonderful. 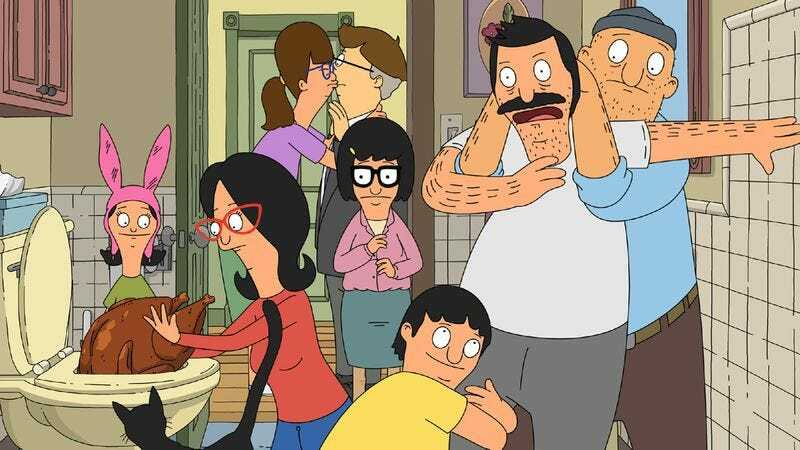 Tina may have said “A turkey in every toilet: only in America!” but really, it’s only in Bob’s Burgers. Louise didn’t have much to do tonight except play detective but she did let it slip that she steals her siblings’ allowances. Teddy’s story about seeing a rat wearing a hat in the toilet (twice!) absolutely killed me. “Same rat, different hat!” Perfect. Teddy is perfect. I’m really glad they brought back Tina’s sleep-thrashing.